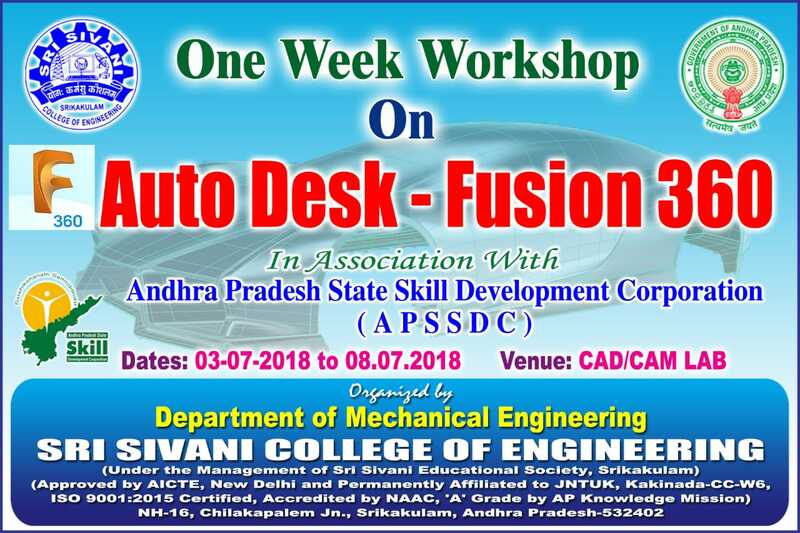 A ONE WEEK WORKSHOP ON “FUSION 360" from 3rd July 2018 Organised By Dept of Mechanical Engineering. 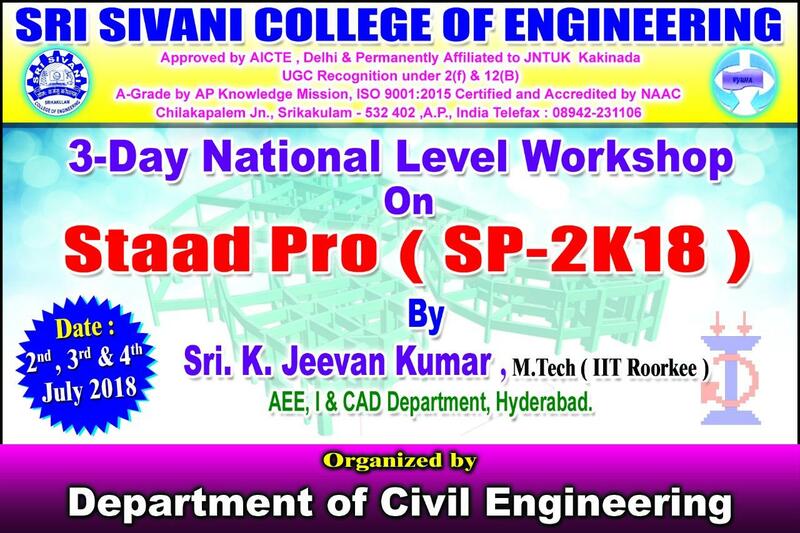 A THREE- DAY NATIONAL LEVEL WORKSHOP ON “Staad Pro(SP-2K18)”Organised By Dept of Civil Engineering. 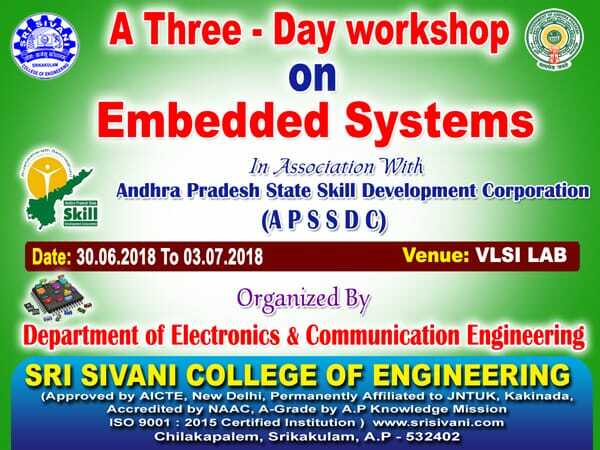 A THREE- DAY SKILL DEVELOPMENT WORKSHOP ON “EMBEDDED SYSTEMS” with courtesy from APSSDC From 30th June to 3rd July - 2018. 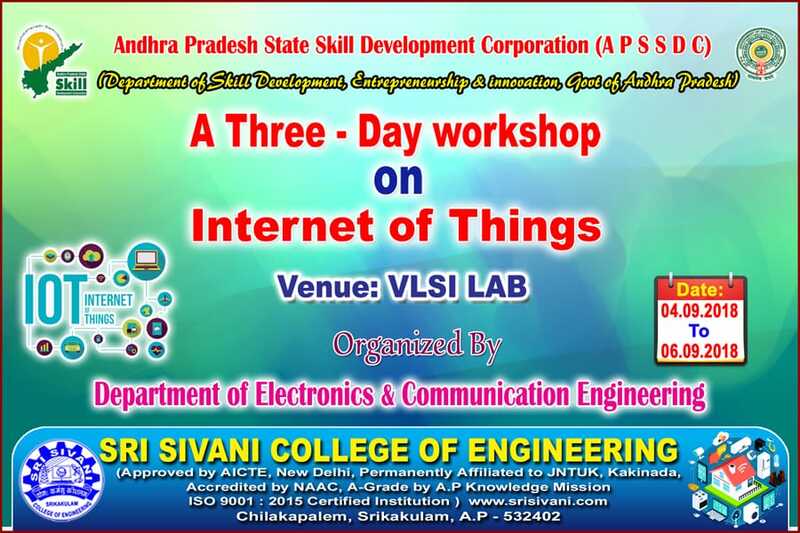 Sri Sivani College of Engineering Alumni Association meet SSCAA - 2016 and Sankranthi Sambaralu @ Sri Sivani Collge of Engineering on 10th January 2016. 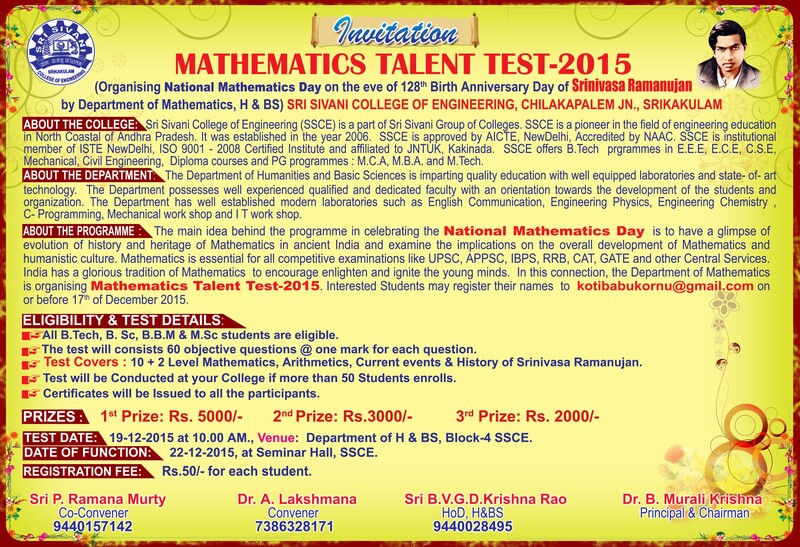 Mathematics Talent Test 2015, on the eve of 128th Birth Anniversary Day of Srinivasa Ramanujan, Dated 22nd Dec, 2015. 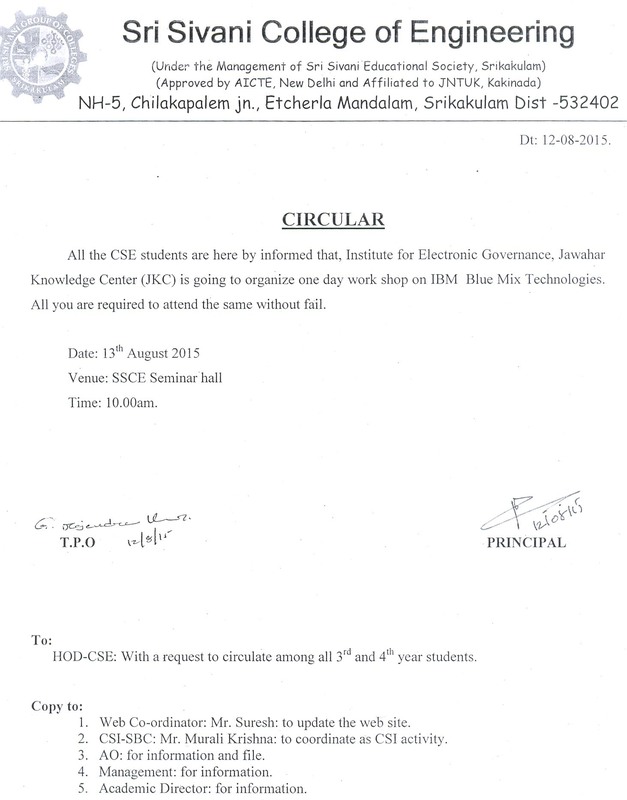 One Day Workshop on IBM Blue Mix Technologies by Jawahar knowledge Center on 12th August 2015. 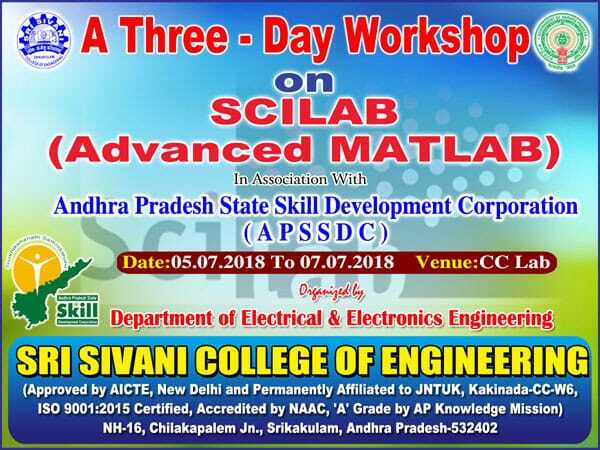 A National Level Technical Symposium "SIVANI SPARKLES"
A National Level Technical Symposium "Sivani Sparkles" on 26th March. 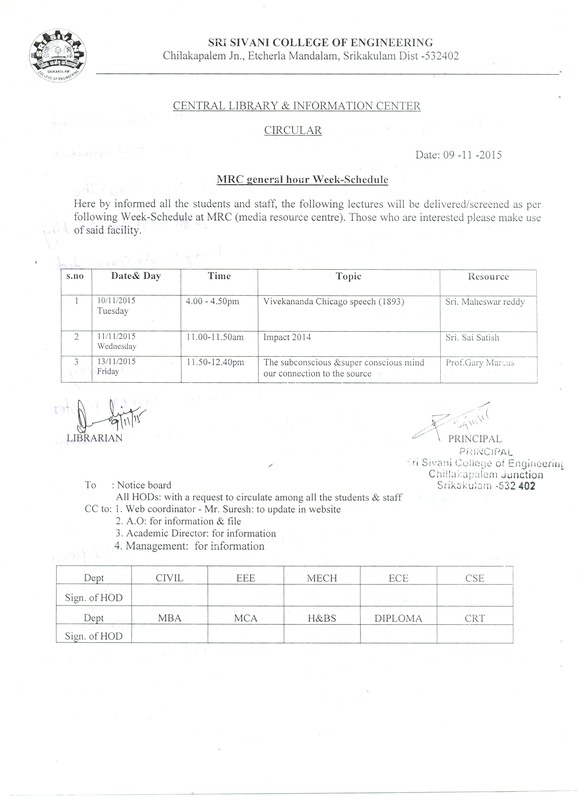 Mphasis pooled Campus Drive on 9 th Sepetember 2014. 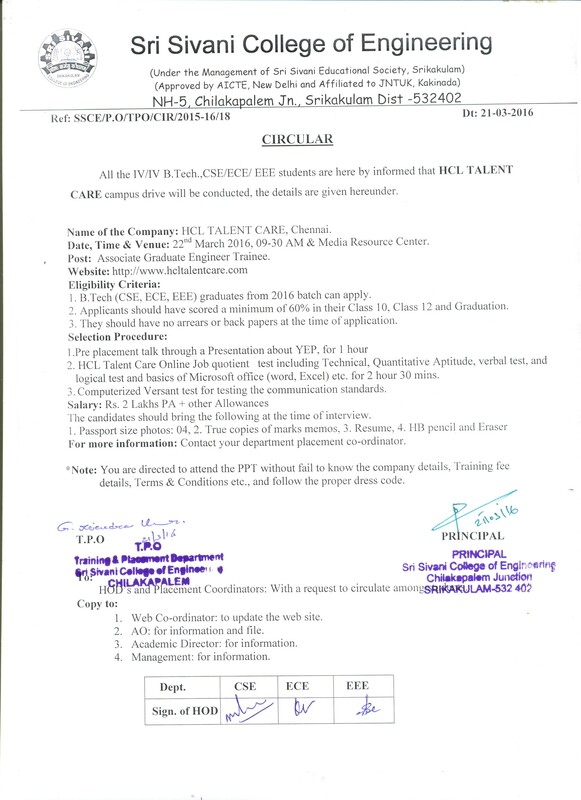 Contact TPO or Dept. 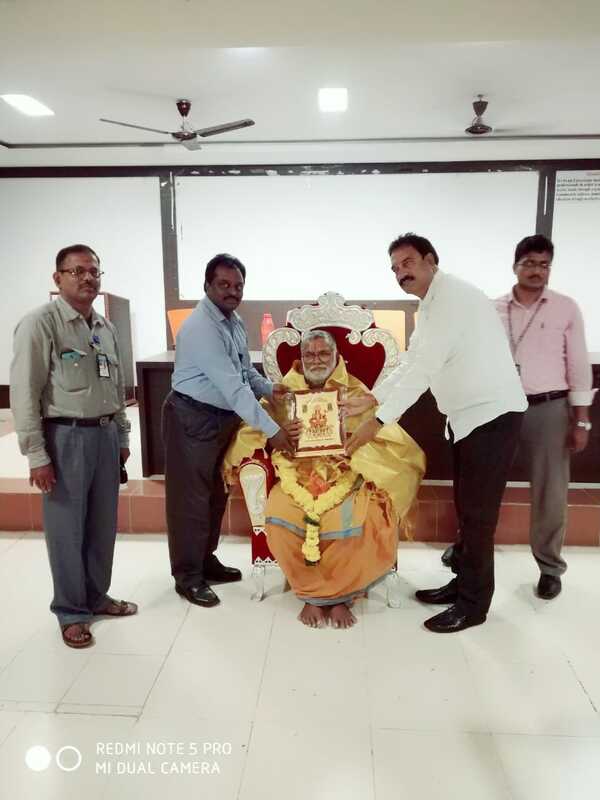 H.O.D. 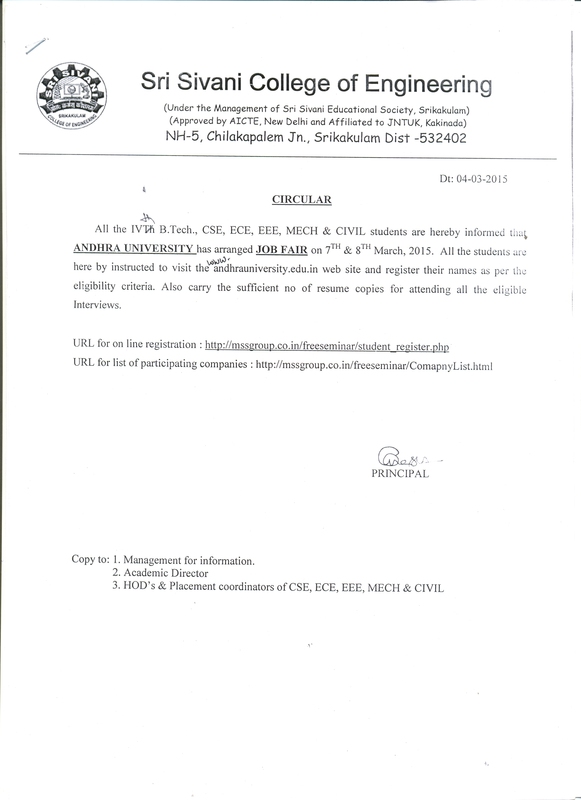 Sri Sivani College of Engineering Donated 2 Lakh Rupees to Hudhudh Cyclone C.M Relief Fund on 24-10-2014. 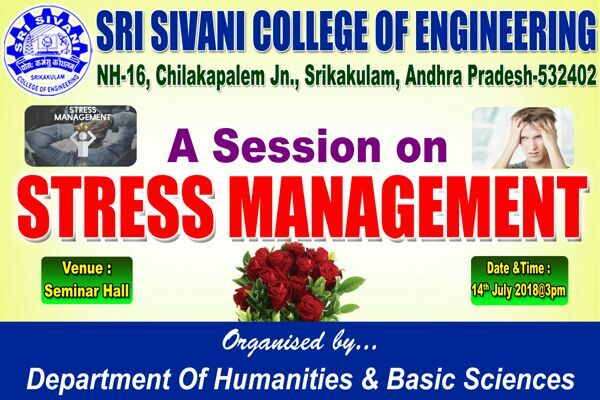 Engineer's Day Celebrations on Sept 15 th, 2014 @Seminar Hall, Admin Block. 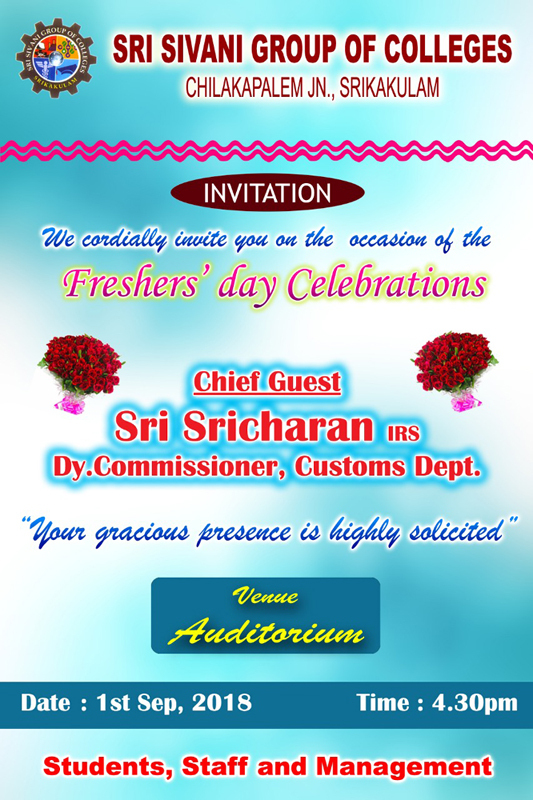 Teacher's Day Celebrations on Sept 5 th, 2014. 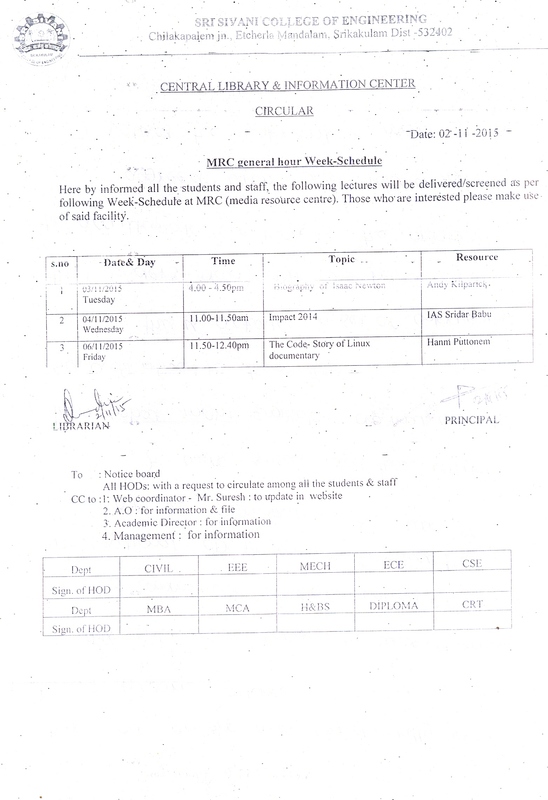 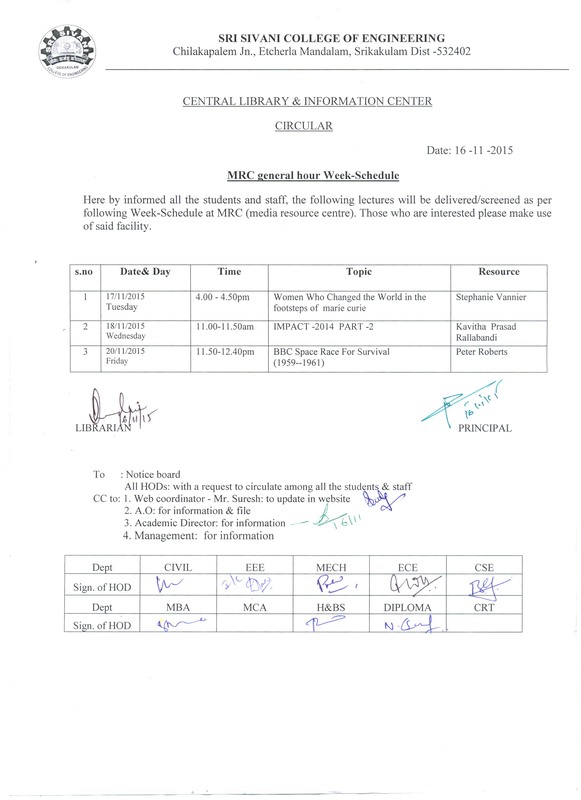 NAAC Peer Committee Visit on 25th, 26th & 27th August 2014. 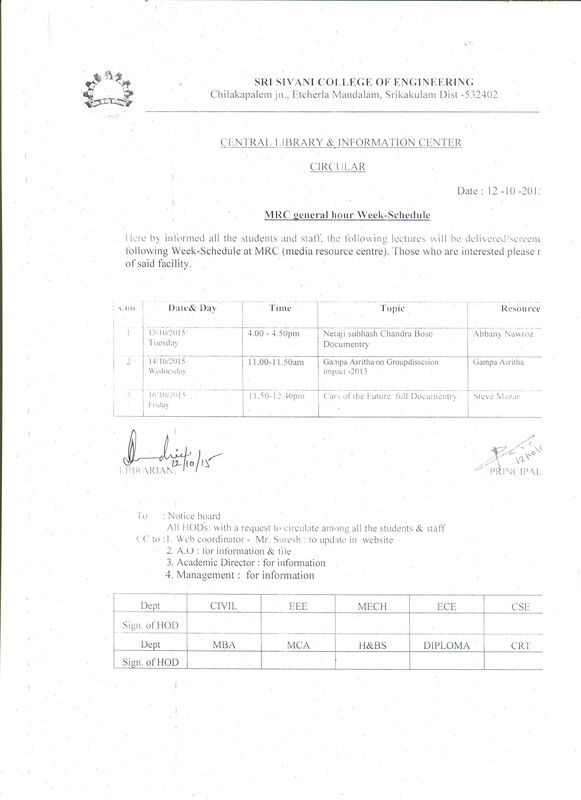 Communication Skills by Draco Consultants starts from 8 th September. 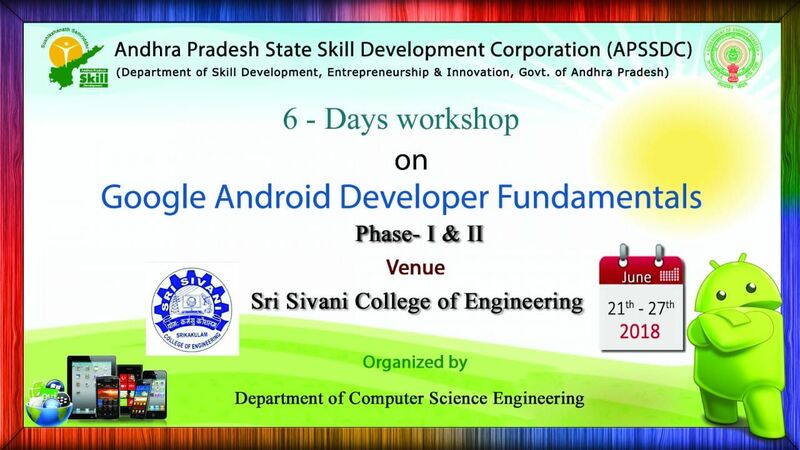 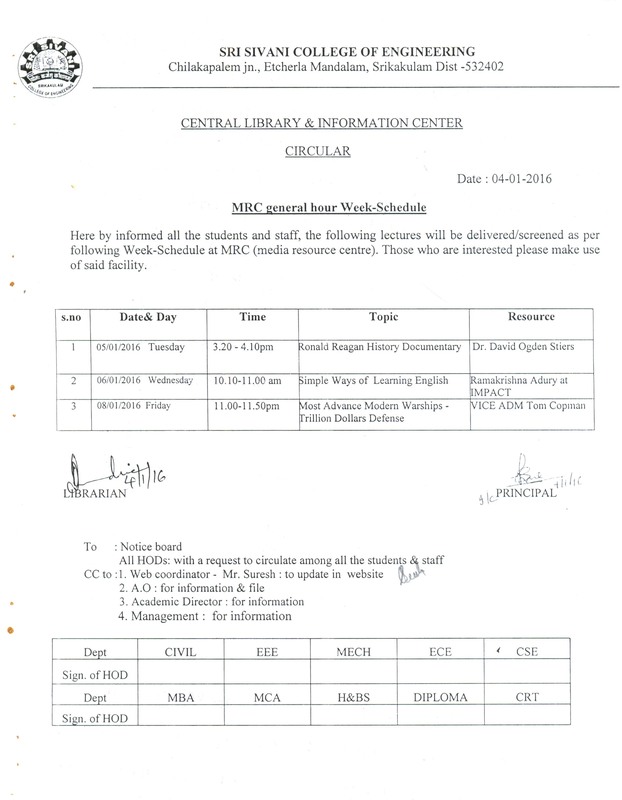 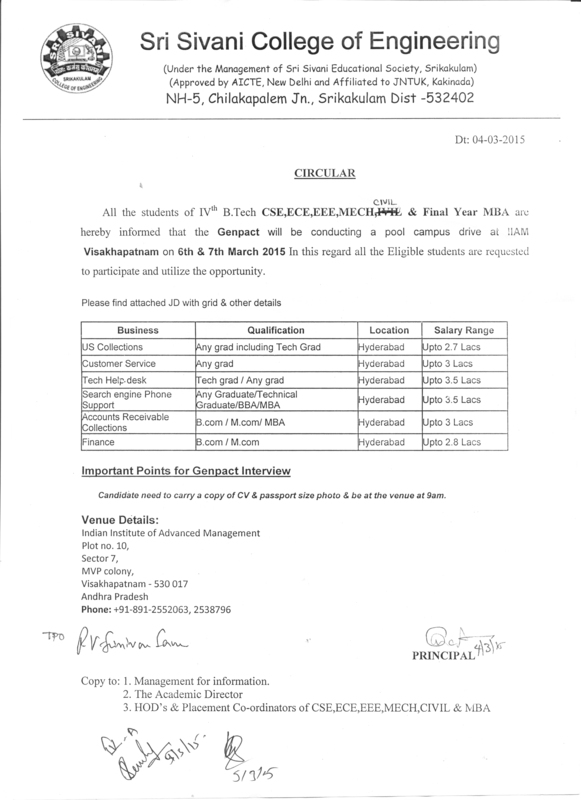 For Admissions Please Contact Y Jagadeesh +91 9493470680.